Children are creating their own black markets to trade and sell salt due to First Lady Michelle Obama’s school lunch rules. During a hearing before the House Subcommittee on Early Childhood, Elementary, and Secondary Education, chaired by Rep. Todd Rokita (R., Ind. ), a school administrator told Congress of the "unintended consequences" of the Healthy, Hunger-Free Kids Act. "Perhaps the most colorful example in my district is that students have been caught bringing–and even selling–salt, pepper, and sugar in school to add taste to perceived bland and tasteless cafeteria food," said John S. Payne, the president of Blackford County School Board of Trustees in Hartford City, Indiana. "This ‘contraband’ economy is just one example of many that reinforce the call for flexibility [with the rules]," he said. Payne noted other problems with the "one-size-fits-all" approach to providing healthier meals to students, including fewer kids participating in the program and higher food waste. The trend started in 2012, when the school lunch law, which was championed by Mrs. Obama, went into effect. "Students are avoiding cafeteria food," Payne said. "More students bring their lunch, and a few parents even ‘check out’ their child from campus, taking them to a local fast-food restaurant or home for lunch." Payne also said school fundraisers like bake sales, have been canceled due to the rules, and "whole-grain items and most of the broccoli end up in the trash" in his district. Dr. Lynn Harvey agreed that the whole-grain requirement is not working, as kids refuse to eat dense and dry biscuits, and "unpalatable" grits. 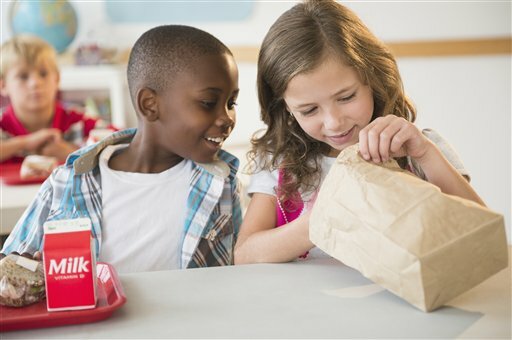 "When it comes to whole grain-rich variations of biscuits, grits, crackers and cornbread, all too often, students simply toss them into the trash cans," said Harvey, who serves as chief of school nutrition services at the North Carolina Department of Public Instruction, which oversees lunch programs for schools that enroll 1.5 million students. "This product dissatisfaction has contributed to a decline in breakfast participation in 60 percent of North Carolina’s school districts," she said. "Biscuits and corn muffins are part of the state’s cultural and regional food heritage, just as bagels are traditional in the Northeast and tortillas in the Southwest," Harvey added. "These foods are very popular breakfast items; the addition of whole grain flour has created products that are dense, compact, dry, and crumbly instead of light, moist, tender, and flaky." Harvey said since the new rules went into effect participation in the school lunch program in her state has declined by 5 percent, "a loss of nearly 13 million meals in two years." School districts across the country have echoed Payne and Harvey’s complaints. Students have noted the unappetizing fare on Twitter, with the viral hash tag #ThanksMichelleObama, which led the U.S. Department of Agriculture (USDA) to launch their own social media campaign, soliciting pictures of more appetizing food. More than 1 million students fled the lunch line during the first year the standards went into effect. House Republicans have introduced legislation to give schools more flexibility in meeting the rules. A bill sponsored by Rep. Kristi Noem (R., S.D.) would "ease sodium restrictions, give school administrators flexibility on some of the rules that have increased costs, including the school breakfast program, a la carte options, and school lunch price increases, and make USDA’s easing of the meat and grain requirements permanent," according to the Hill. "The clear solution to these problems is local leadership and flexibility," Payne said. "When local school districts have the authority and flexibility to make adjustments honoring the spirit and intent of the law they can provide students with healthy, nutritious, and appetizing meals." This entry was posted in Issues and tagged Education, Michelle Obama. Bookmark the permalink.